Creation, Preservation and Destruction of the whole Universe is as per Almighty's Will. 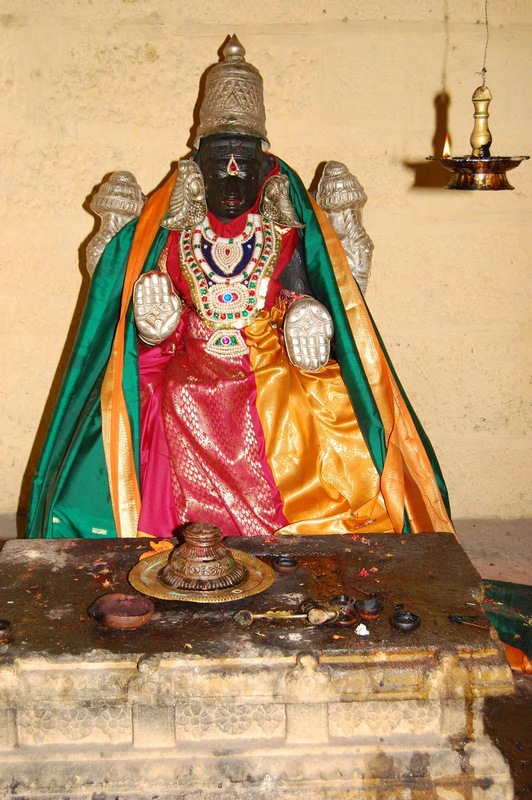 As such I had Sri Rama's grace to visit the wonderful temple belongs to 15th century at Venkatampettai in Cuddalore district.It is understood that under the rule of Venkatapathy Nayakkar between 1464 and 1478 this hamlet was existing. French rulers during 1478 have gifted this village to Anandarangam Pillai of Pudhucherry. 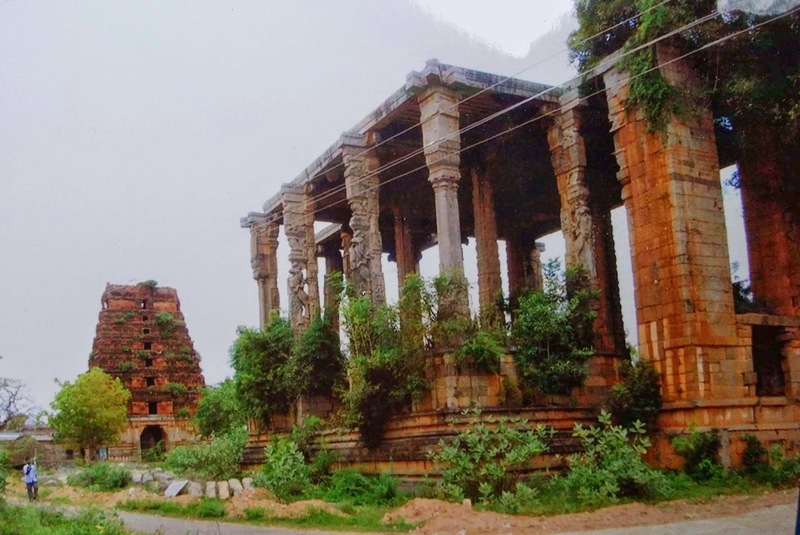 It is understood that this temple was either renovated or constructed by the sister of the king who ruled the Gingee. This Temple has many special features. It is in the sprawling area of the land scape with 236 X 129 feet granite stone temple with high structure of mandap, 7 stage Rajagopuram, 50 feet high granite stone Unjal mandapam, Stand for Temple Car and Theertham spread over to one Acre land. The distance between the Theertham and Temple itself is about one KM which speaks the greatness of this temple. It has many more wonders. 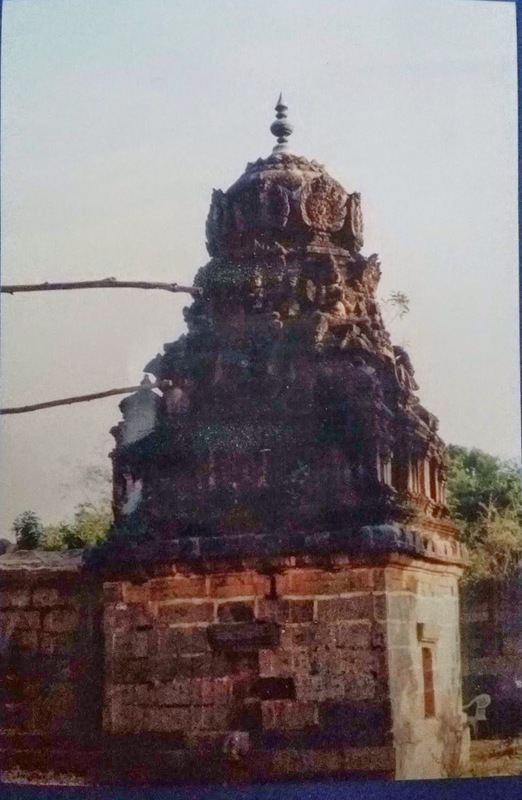 I had chance to visit this temple once during my young age some 30 years ago with some relatives and we could not enter the temple as it was in the ruined condition. It shall the God's will that the revered Hindu Sankarar Sri Kamatchi Ambal Temple sthapakar and Trustee Sri VidyaBhushanam Siva Sri V.A.S. Bhaskara Swamigal from Ham Nagar, Germany visited this place when the swamigal took tour to various temple in Tamil Nadu. It is Swamigal greatness and gracious of Lord Venugopalan and Anandhasayana Ramar that Swamigal took up the work without waiting for any body's help. It is astonishing to hear and see the photos that the entire structures was removed with out any damage and the same structures have been restored and renovated in the same place without any modification of using the all granite stone pillars of about 20 feet height. 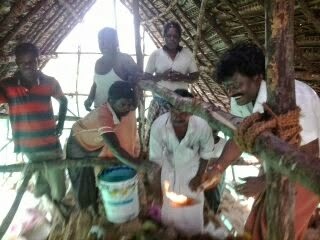 It was a himalayan task that one swamigal has spent all the money to renovate the temple with crores of rupees and restored the divinity of the deities and greatness of the structures.To start with Kumbabishegam was performed at the first instance on 02.02.2009. After that, daily pooja has been started in a small way. It is reliably understood that rarely devotees are started coming to this Temple. 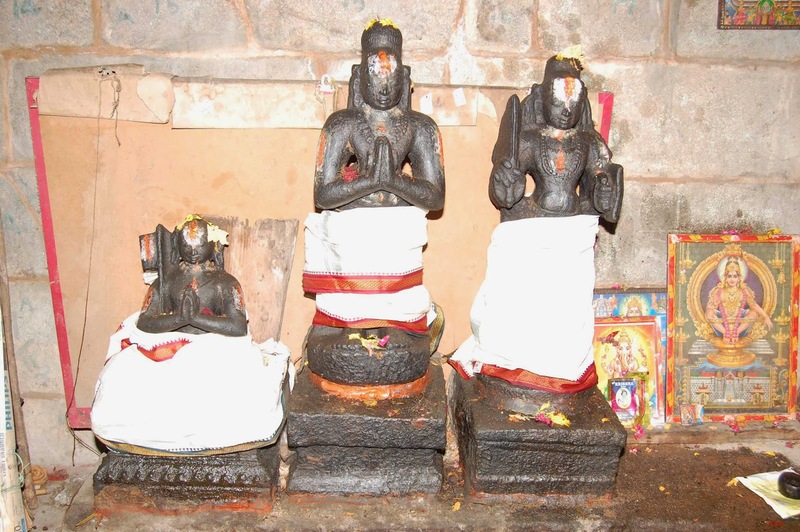 The speciality of the temple is the Charming Sri Venugola Swamy with Bhama and Rukmini. As per the myth and scripts God with consorts will give boon to every one who have dharshan of the God. God always in kindness in the presense of consorts. Sri Venugopalaswamy is in standing posture always ready to give boon to the devotees taking dharshan of him and the consorts extends blessing. 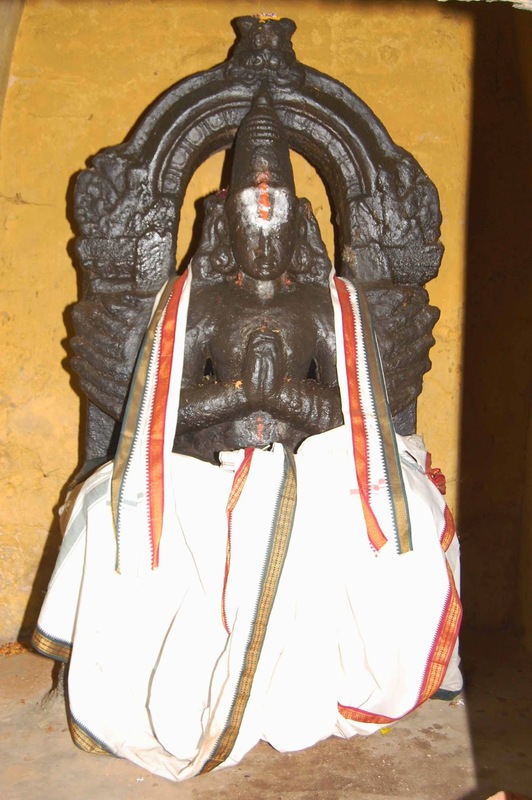 Other rare and dazling feature of the temple is dharshan of Sri Anandhasayana Ramar. One may ask why it is rare. Ramar always in the standing posture in all temples. Sayana Kolam (sleeping posture) is very rare. 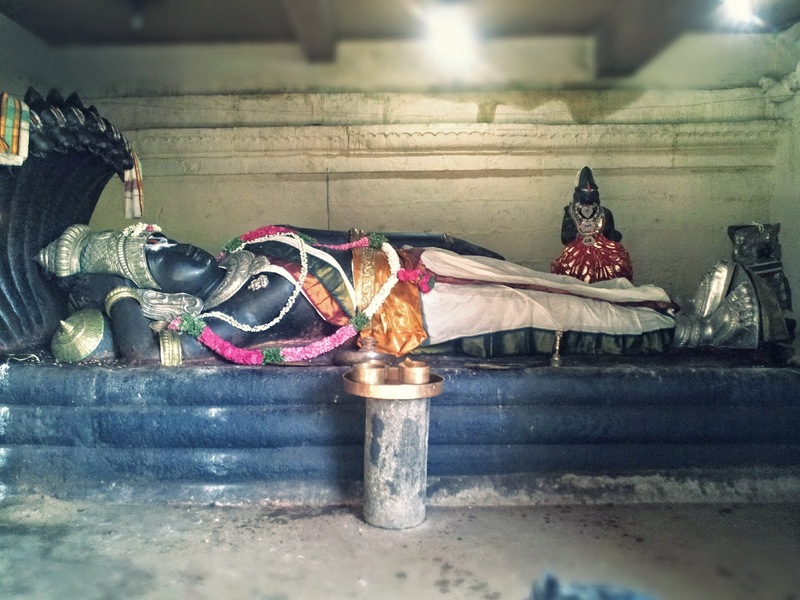 The deity is about 18 feet, sleeping on Adhi Sesha and Goddess Seetha in sitting posture. The face of Lord Rama is as beautiful as Lord Ranganatha. One may wonder why it is Sri Ramar and Not Lord Ranganatha.It is clear from the explanation given by the Battacharriyar that Anandhasayana Ramar has two hands and have no counch and chakra as lord assumes human form. Lord keeps his head in a stone as he was in the exile in the forest. 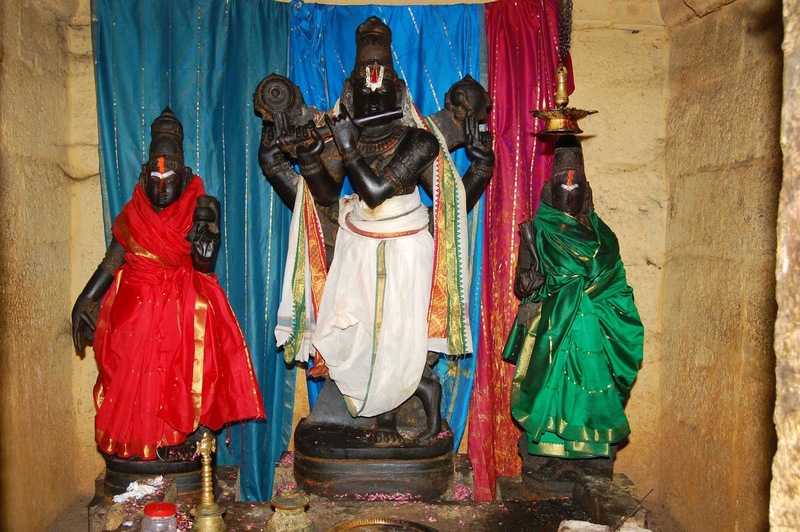 Lord Ranganatha have two consorts Sridevi and Bhoodevi. Here Ramar has one consort. 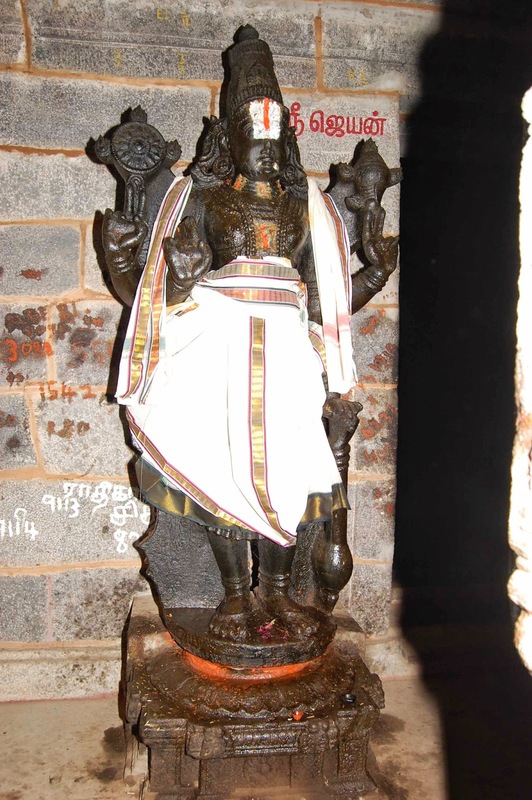 Lakshmana, avatar of Adhisesha always with Lord exists here in the form of 7 head Adhi seshsa. More so LordAnjeneya as bhaktha in front of his feet. 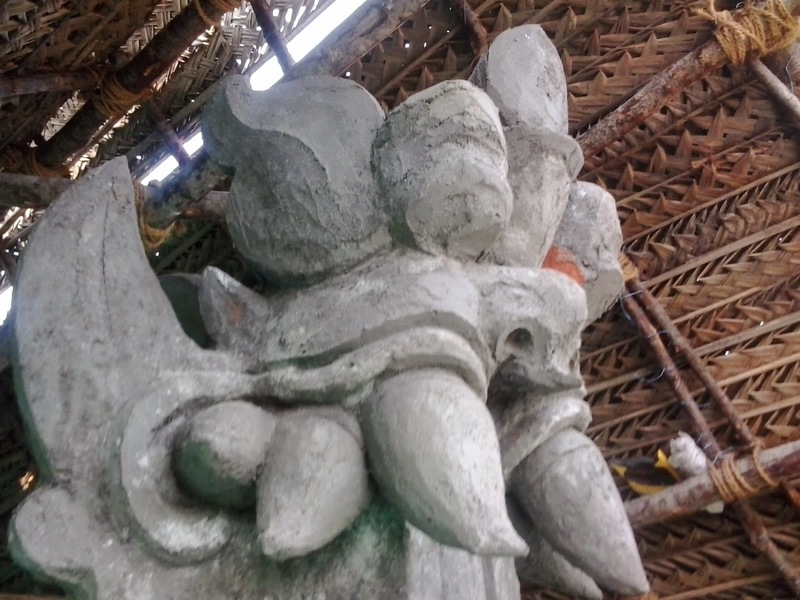 It clearly tells it is a Sayana Ramar a rare deity. 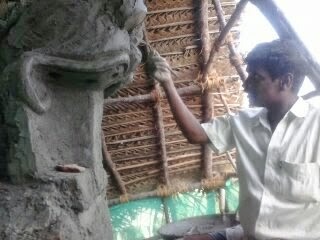 To the knowledge of many one more Sayana Ramar is in Thirupullani near Rameswaram. Anandhasayana Ramar temple at this place is more opt for other reason also. That, this place was a dense forest earlier and named as Thennarkadu (South Forest) and many name of the habitats in these are come chainly depicting Ramayana. Just for example Thindivanam, Villupuram, Seethakuppam, Ammbu booti palayam like that. The distance all these place are about 80 kms. More evidance is available like these to show Lord Ramas was wandering in this area. 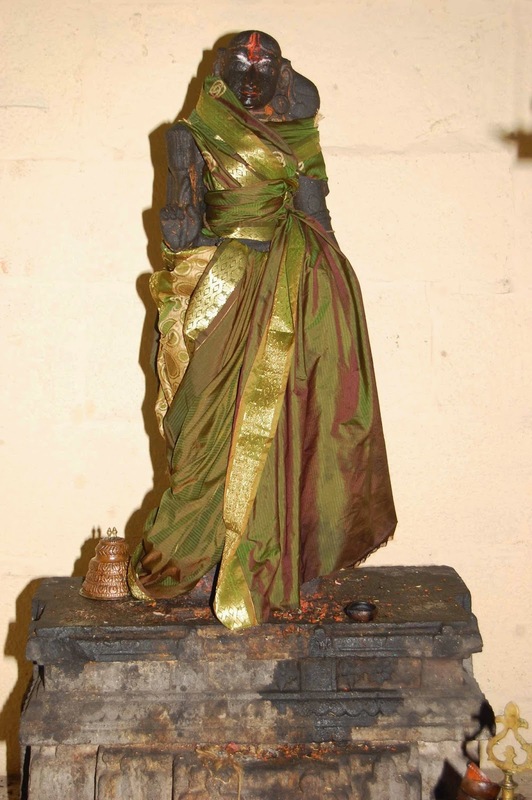 Sayana Ramar is the will of the God and dazzling posture to protect and liberate the devotees. Another deity in the sannathi is Paramapatha Vasan (Lord Vishnu) who is to liberate the jeevathma at the end of the life. 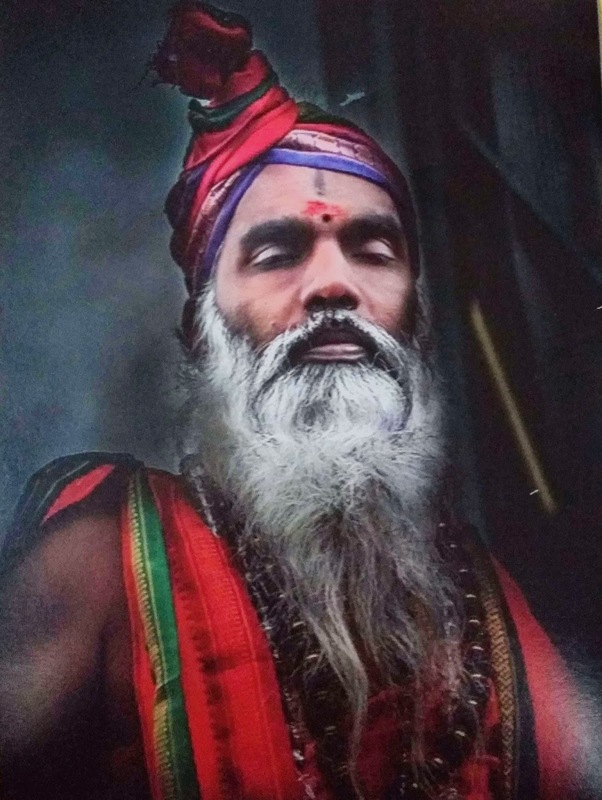 "Anantham, Avyayam, Kavihum, Samudhre antham Viswa Sampuvam" (Narayana Suktham). Meaning Lord Narayana is Omni present, Omni potant , all pervading gives all mangalam at the end of the life. 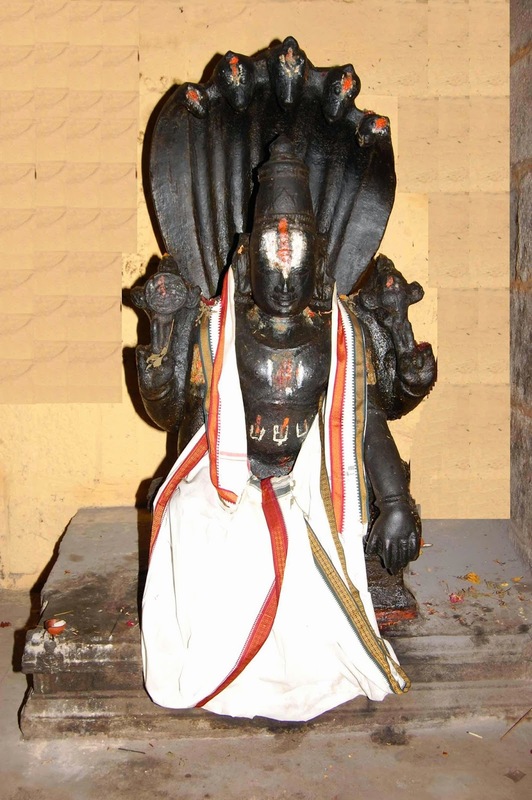 The same Vishnu is residing in sitting posture in this shrine. After having dharshan of the three it fulfilss the famous proverb in the Vashnavism "Ninran, Irundhan & kidanthan"
In all temples seperate sannathi is there for Thayar. 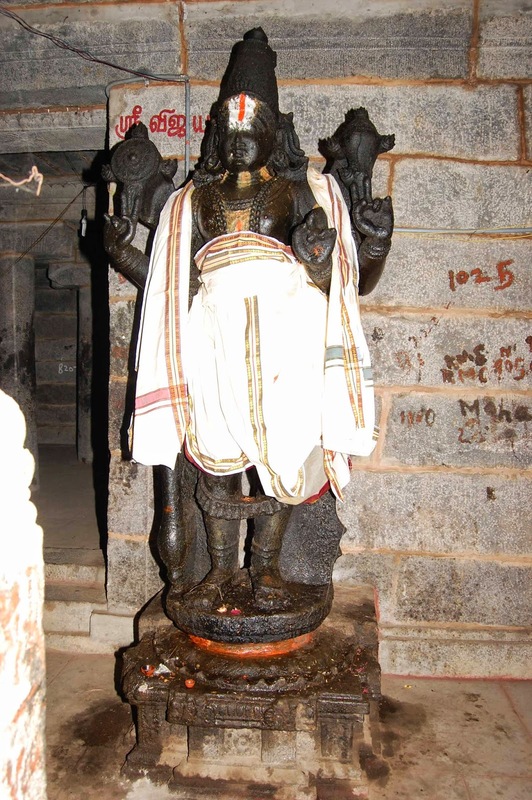 Sengamalavalli is the name of the Goddess Lakshmi in this shrine. How this beautiful and merciful goddess has hide in this century is the wonder. Other Sannathis' in this shrine is Sree Andal, Sri Garudashwar and other Azhwars. This great temple was not noticed by any Jeers or any religious leaders for several centuries is the great wonder and why is the question every one to ask. But the God has decided who to take care of what and when. That is why the revered Hindu Sankarar Sri Kamatchi Ambal Temple sthapakar and Trustee Sri VidyaBhushanam Siva Sri V.A.S.Bhaskara Swamigal from Ham Nagar, Germany who visited the shrines in Tamilnadu visited this place with the request of Mr. Loganathan of the nearby place and started to restore the beauty of this sacred monument having heritage value spending crores of rupess. 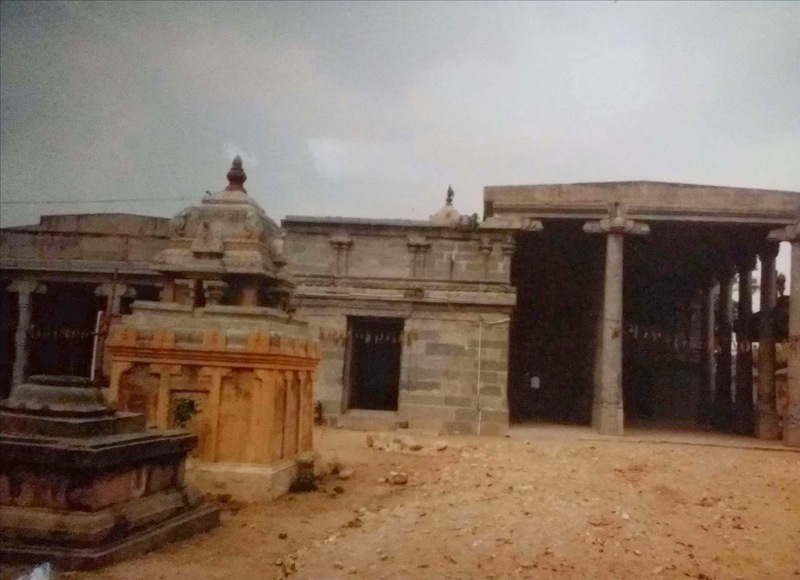 The old stone pillars and roofs have been removed and after laying foundation it was renovated ,it is to be said more specifically restored the old heritage temple in it is original form. When you visit this place you can see all sannathis and also mandapams have been renovated in it old texture with new strength. 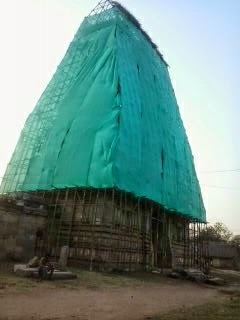 Mandap work completed by 75% at the time of consecration. Mandap view at the time of kumbbishegam and now as at present can be seen as per the pictures below. Swamiji has obtained permission from Hindu Religious Endowment Board vide no. 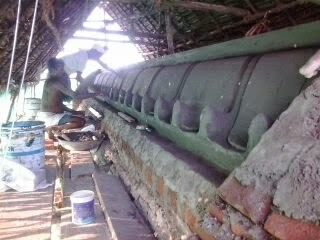 55682/2010/Y dated 07.06.2011 for renovating Rajagopuram and no. 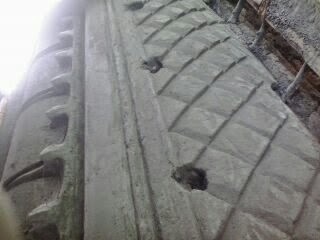 45404/2011/Y6 dt. 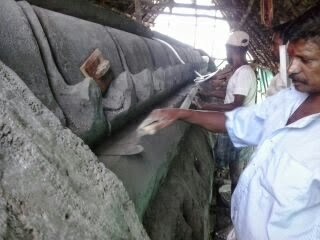 26.06.2012 for renovating the pheriperal wall (Madhil Suvar). Since it is understood that swamiji is preoccupied with Kumbabishegam of Sree Kamatchi amman Temple at Germany the work is in sluggish pace. 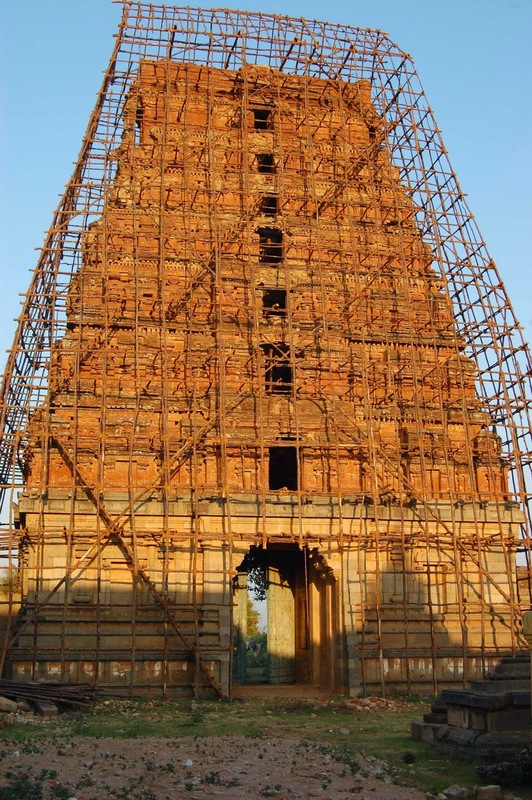 Swamiji has made arrangements for making scaffolding with casurina poles and with the meagre contribution from the dear devotees Rajagopuram work was started on 30.03.2014 and the recent photographs of current status of the Rajagopurams will be good news for devotees. Readers and devotees may now understand the greatness of the temple and how important it is to preserve this monument to leave it to the next generation. 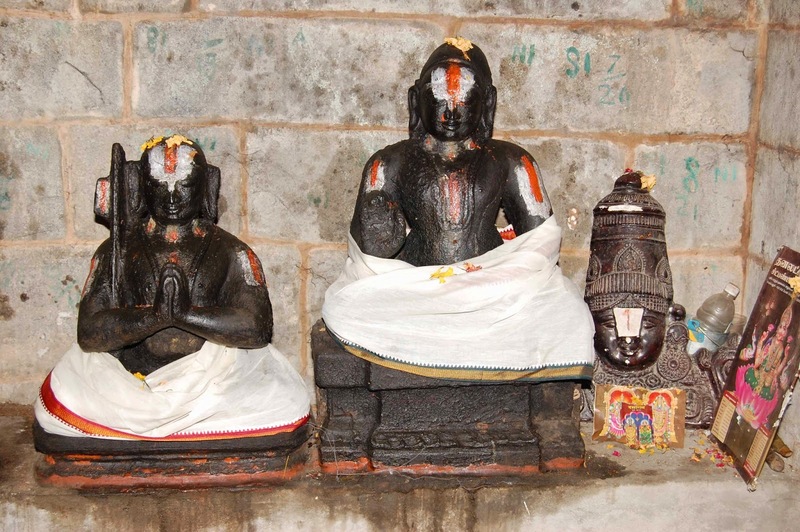 The shrine is situated in between Cuddalore and Vadalur road near Kurinjipadi. From Cuddalore it is 28 KMs. and from Vadalure it is 9 K.Ms. and from Kurinjipadi it is 6 KMs. Bus facility is available from Kurinjipadi , when you travel by any mode the high rise Rajagopuram welcomes you to have dharshan of SayanaRamar, Sri Venugoplaswamy, Sree kamalavalli Thayar and Lord Vishnu.